Yes, it really tastes as good as it looks. 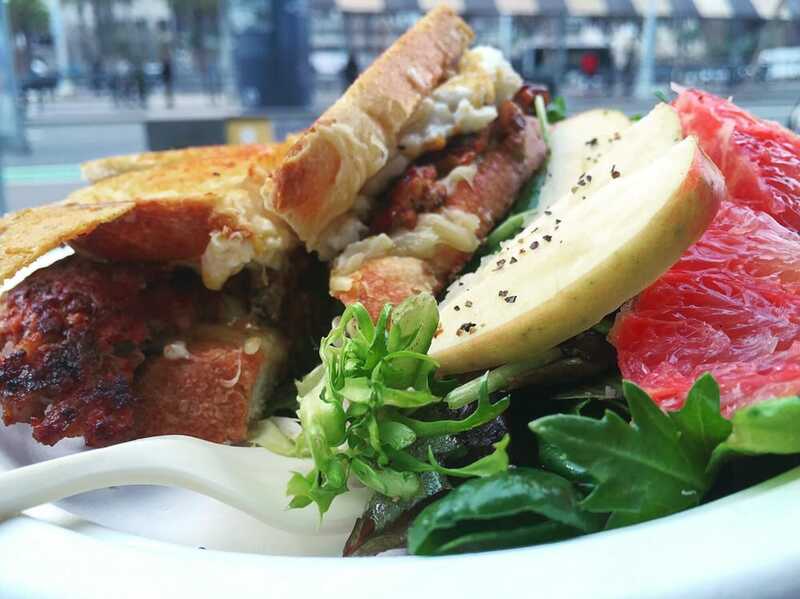 Specifically, the newspaper swoons over “The Works” sandwich, an elaborate grilled cheese with chorizo. 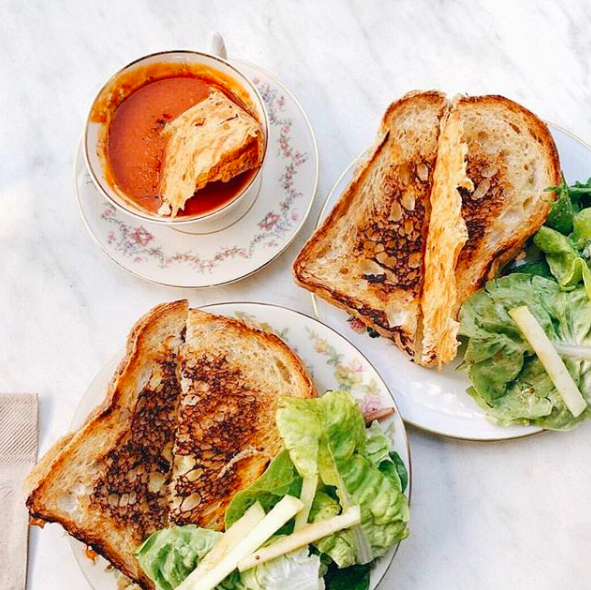 But really, you can’t go wrong with any sandwich on the brief menu, which focuses mainly on gourmet grilled cheese beauties. The two salads, daily soup and desserts are delicious, too. So plan on just getting one of each and calling it a happy day. Ingredients change frequently, depending on season and what’s best from the farmers’ markets. And she knows the farmers’ markets well, after a decade working at them and perfecting her melty marvels. Her new shop at The Barlow in Sebastopol isn’t much bigger than a booth, but she uses every inch to craft delights like three-cheese fromage a trios ($8), fromage with dirty girl tomato + basil ($12), or fromage with albacore tuna ($13). Many of the melt recipes are fancy, such as the honey lavender bacon and farm egg ($15), fennel sausage and apple quince mostarda ($15), and grass fed beef filet with farm egg, arugula and chimichurri ($16). The price includes a small seasonal salad, too. Add in soup, certainly, which for winter, tempts with specialties like pumpkin ginger soup served with a dollop of curry crema, or a healing bowl of bone broth. And indulge in the changing selection of sweet treats – if the bittersweet chocolate chip cookie with rye, poppy seed and sour cherries is available, pounce on it, it’s spectacular ($3). Salads are serious stuff, too, served in generous portions. You guessed it, they change daily, but some options might include fields greens with nuts, seeds, dried fruit, chevre and seasonal veggies ($12), or toasted fennel sausage with braised greens, roasted vegetables and farm egg ($15). Note that this is order-at-the-counter, with no indoor seating. But one of the Barlow’s many charms is that is has ample season with picnic tables, lawn benches, and standing counter shelf space. Details: 6780 Depot Street, #110 (The Barlow), Sebastopol, 707-824-5600.